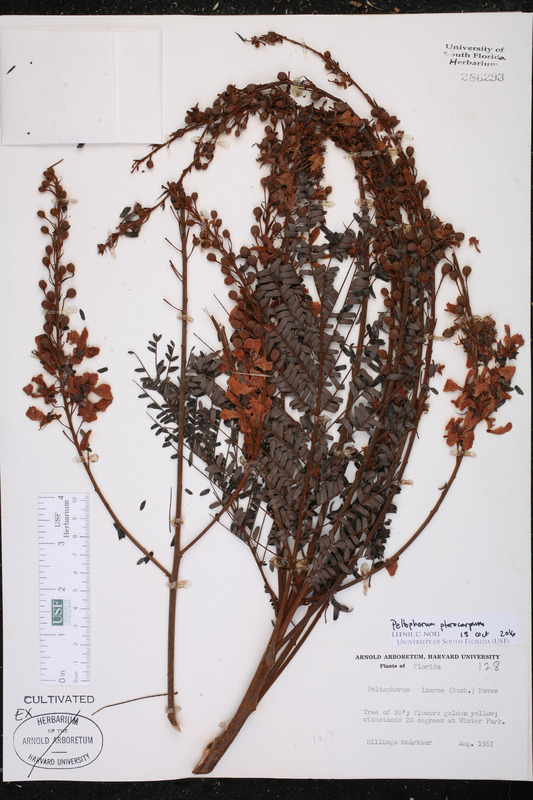 Citation PELTOPHORUM PTEROCARPUM (de Candolle) Backer ex K. Heyne, Nutt. Pl. Ned.-Ind., ed. 2. 755. 1927. 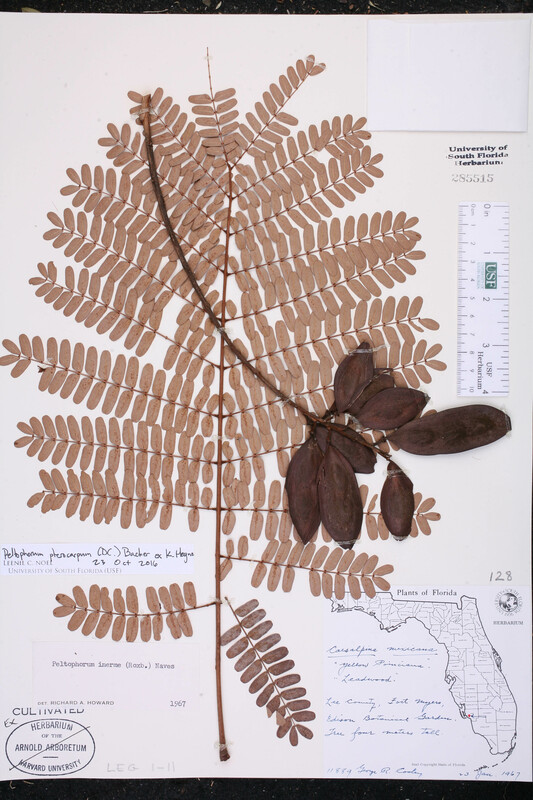 Basionym: Inga pterocarpa de Candolle 1825. 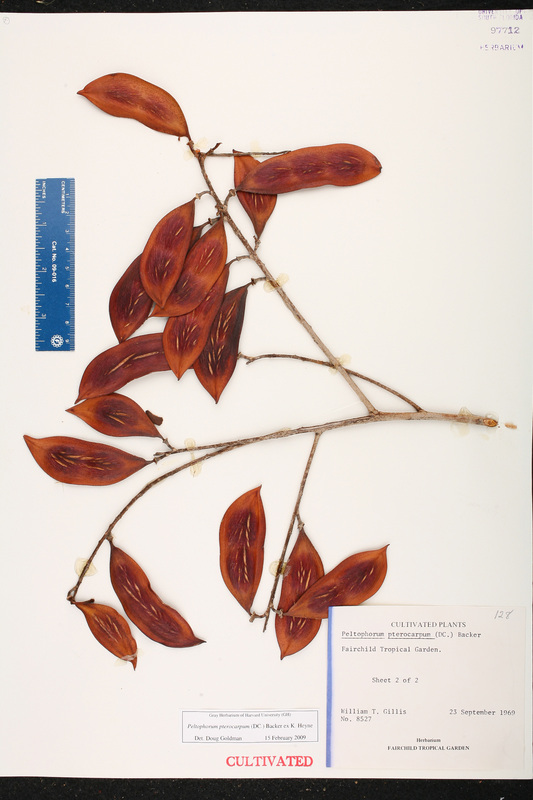 Inga pterocarpa Inga pterocarpa de Candolle, Prodr. 2: 441. 1825. Baryxylum inerme Baryxylum inerme (Roxburgh) Pierre, Fl. Forest. Cochinch. 4: sub t. 390. 1899. 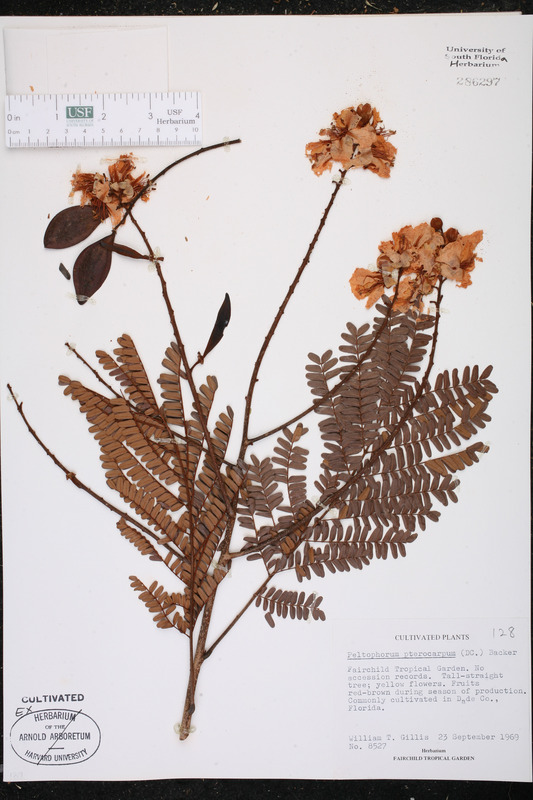 BASIONYM: Caesalpinia inermis Roxburgh 1832. 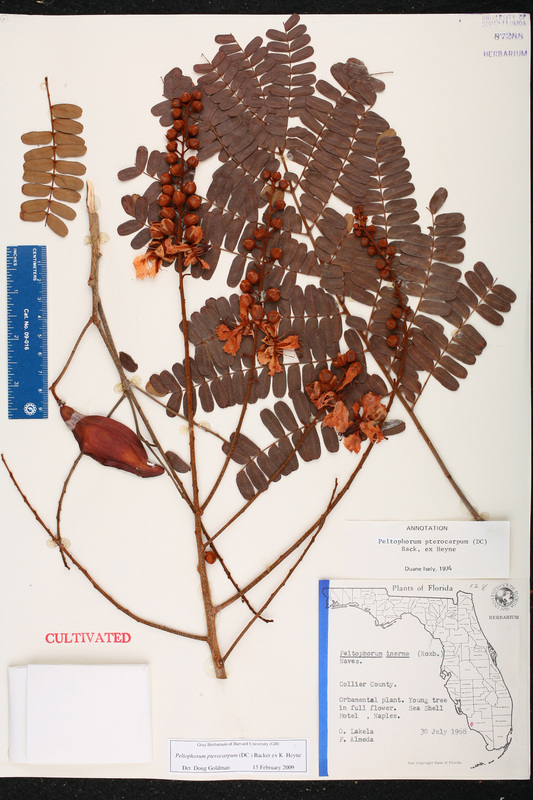 Caesalpinia arborea Caesalpinia arborea Zollinger ex Miquel, Fl. Ned. Ind. 1(1): 112. 1855. 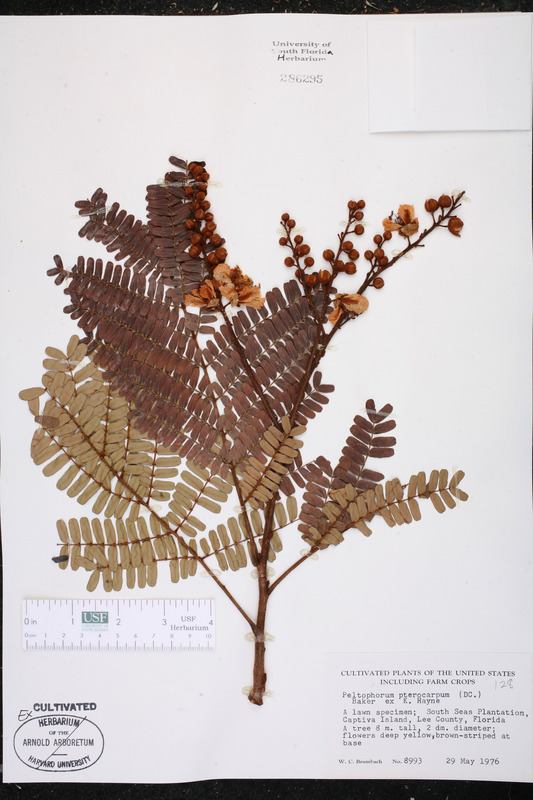 Caesalpinia ferruginea Caesalpinia ferruginea Decaisne, Nouv. Ann. Mus. Hist. Nat. 3: 462. 1834. 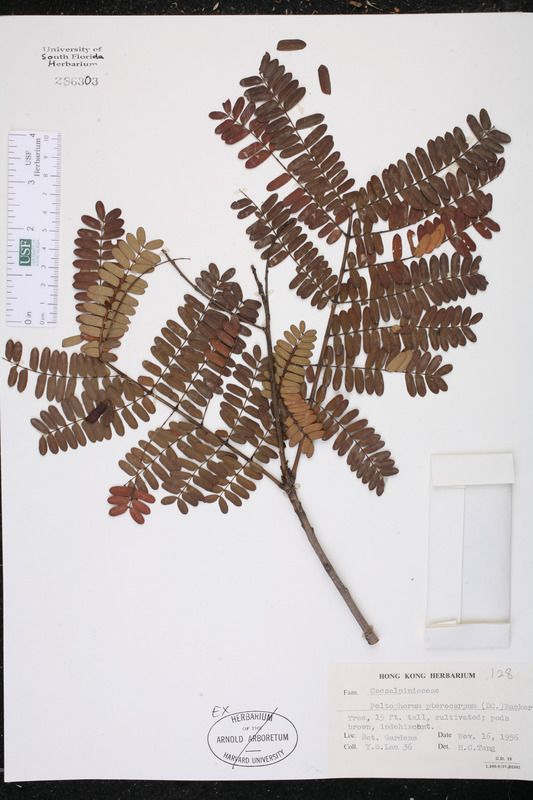 Caesalpinia gleniei Caesalpinia gleniei Thwaites, Enum. Pl. Zeyl. 414. 1864. TYPE: SRI LANKA: Trincomalee, Jun 1863, Glenie s.n. (Thwaites 3815) (holotype: PDA; isotypes: BM, GH, K). Caesalpinia inermis Caesalpinia inermis Roxburgh, Fl. Ind., ed. 1832. 2: 367. 1832. 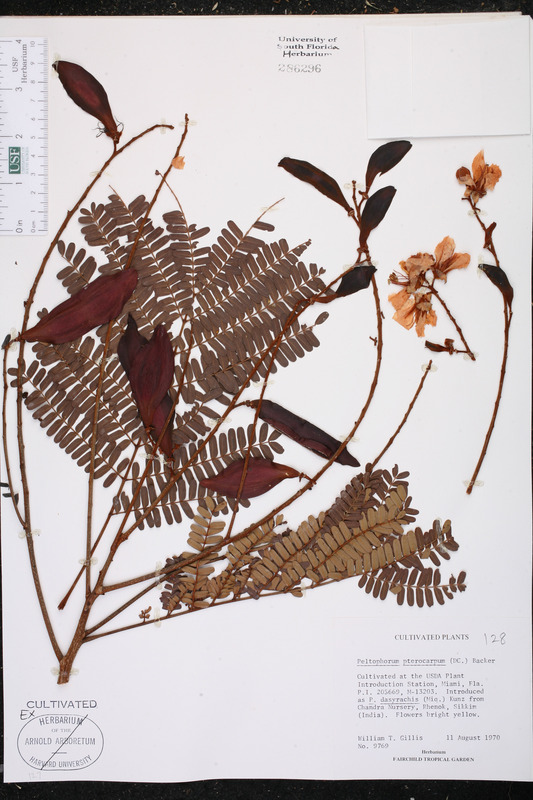 Caesalpinia roxburghii Caesalpinia roxburghii D. Dietrich, Syn. Pl. 2: 1494. 1840, nom. illegit. 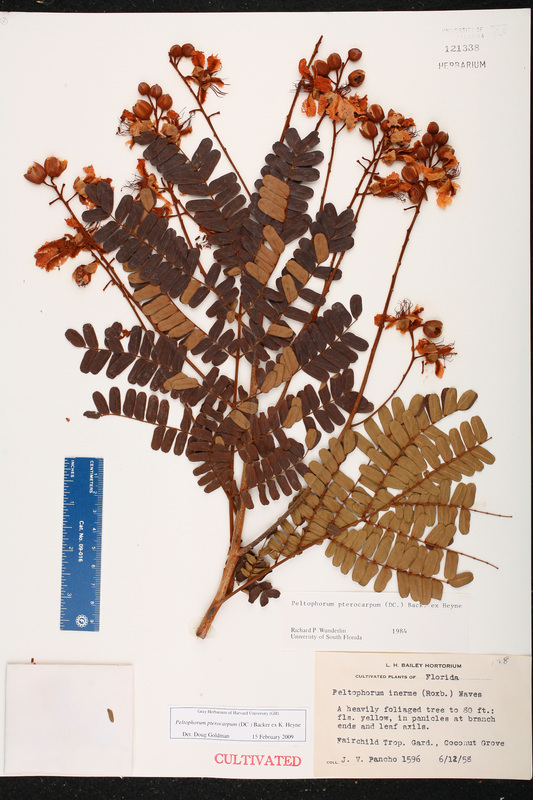 BASIONYM: Poinciana roxburghii G. Don 1832, nom. illegit. 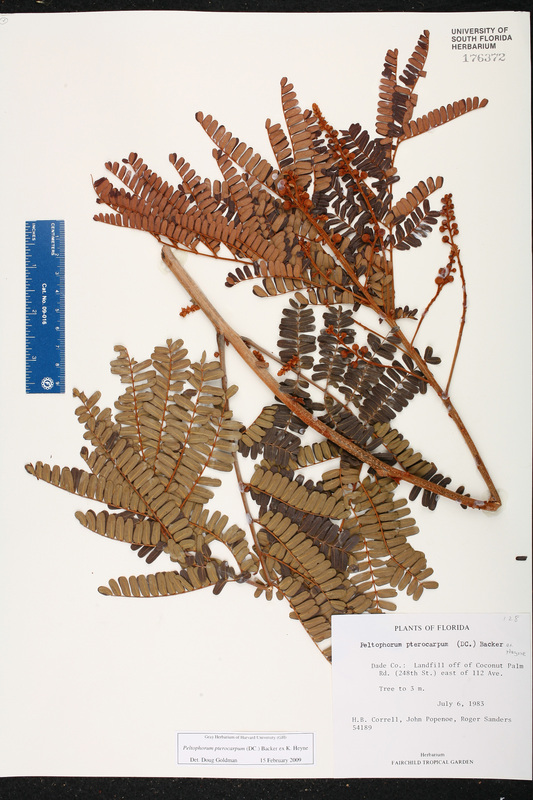 ; Caesalpinia inermis Roxburgh 1832. Peltophorum ferrugineum Peltophorum ferrugineum (Decaisne) Bentham, Fl. Austral. 2: 279. 1865. 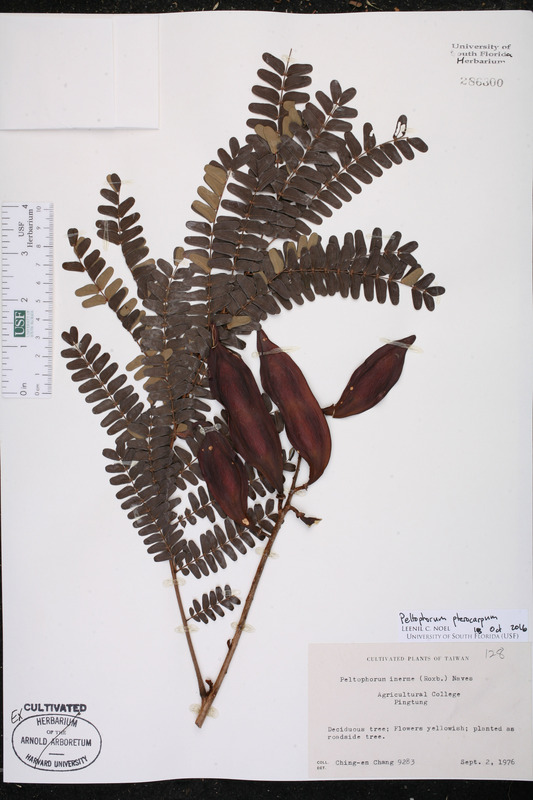 BASIONYM: Caesalpinia ferruginea Decaisne 1834. Peltophorum inerme Peltophorum inerme (Roxburgh) Craib, Fl. Siam. 1: 498. 1928. 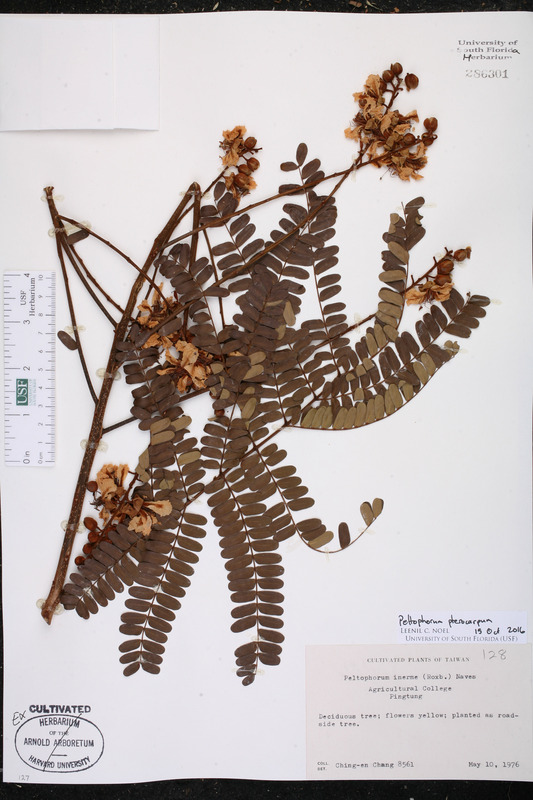 BASIONYM: Caesalpinia inermis Roxburgh 1832. 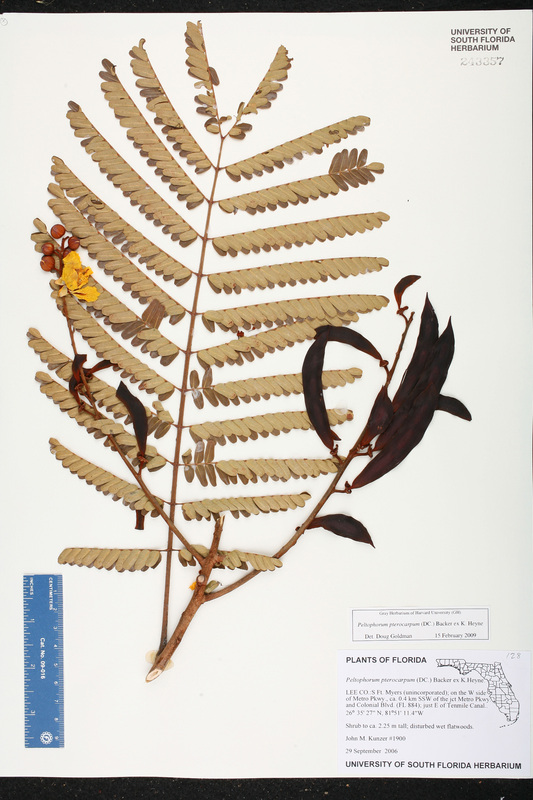 Peltophorum roxburghii Peltophorum roxburghii O. Degener, New Ill. Hawaii Fl. 1: Fam. 169b. 1938. 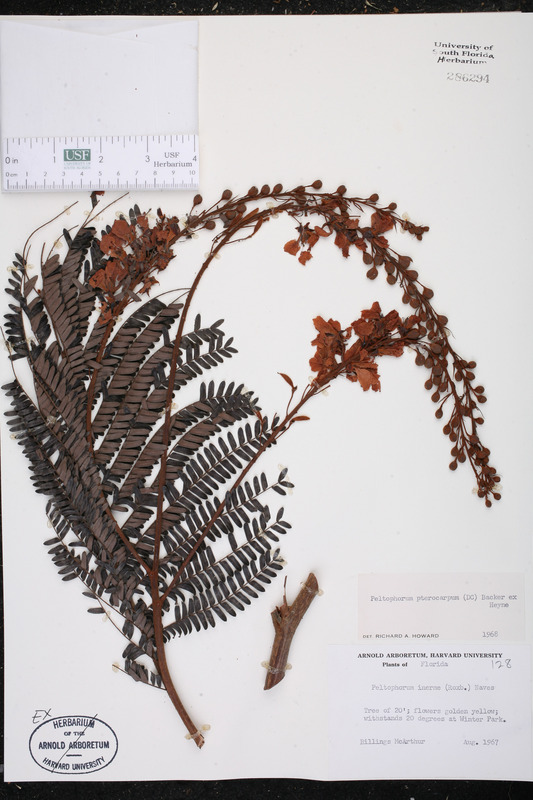 BASIONYM: Poinciana roxburghii G. Don 1832, nom. illegit. 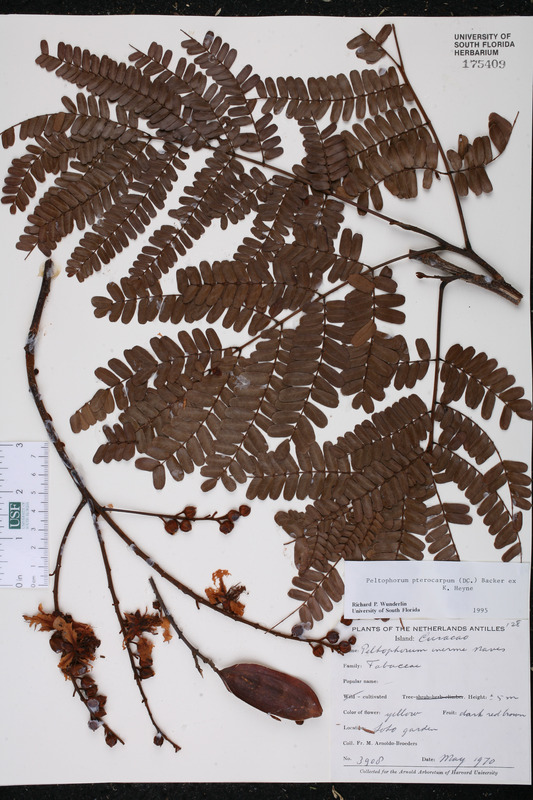 ; Caesalpinia inermis Roxburgh 1832. 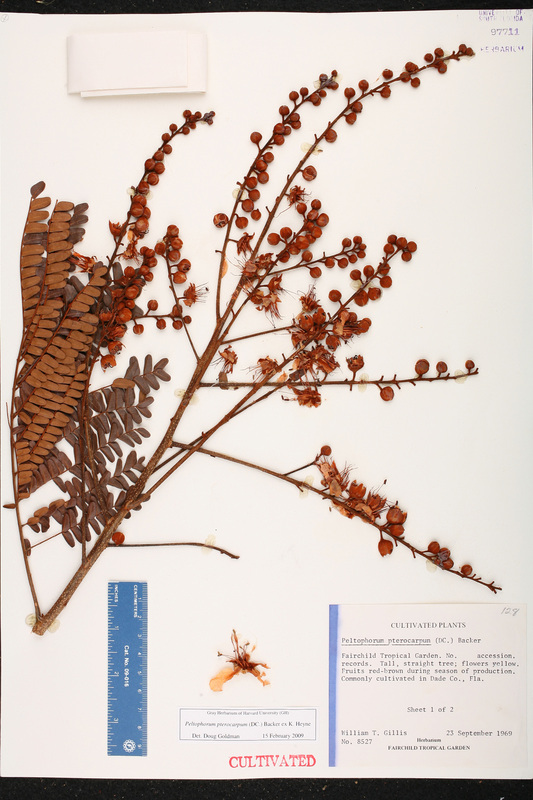 Poinciana roxburghii Poinciana roxburghii G. Don, Gen. Hist. 2: 433. 1832, nom. illegit. 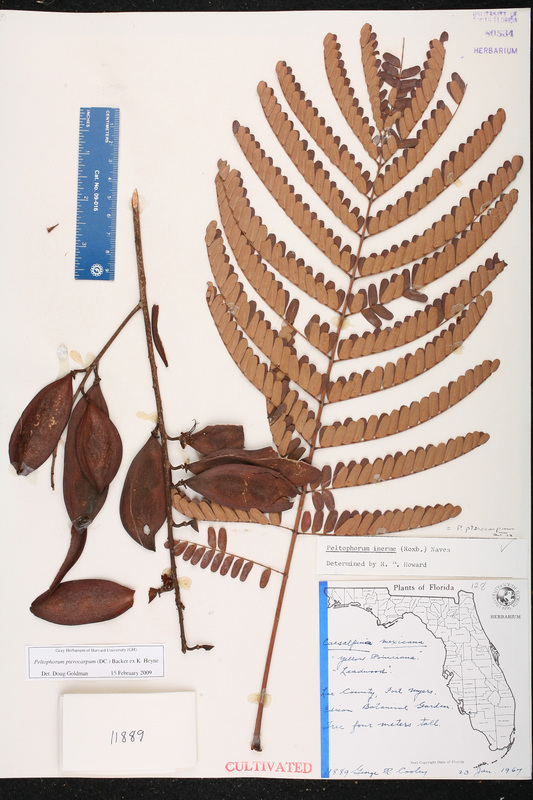 BASIONYM: Caesalpinia inermis Roxburgh 1832. USA Florida Miami-Dade Co. 23 Sep 1969 W. T. Gillis 8527 CULTIVATED. Sheet 1 of 2. USA Florida Miami-Dade Co. 23 Sep 1969 W. T. Gillis 8527 CULTIVATED. Sheet 2 of 2. USA Florida Lee Co. 23 Jan 1967 G. R. Cooley 11889 CULTIVATED. USA Florida Collier Co. 30 Jul 1968 O. K. Lakela s.n. CULTIVATED. USA Florida Miami-Dade Co. 06 Dec 1958 J. V. Pancho 1596 CULTIVATED. USA Florida Orange Co. Aug 1967 B. McArthur s.n. CULTIVATED. USA Florida Lee Co. 29 May 1976 W. C. Brumbach 8993 CULTIVATED. USA Florida Miami-Dade Co. 11 Aug 1970 W. T. Gillis 9769 CULTIVATED. P.I. 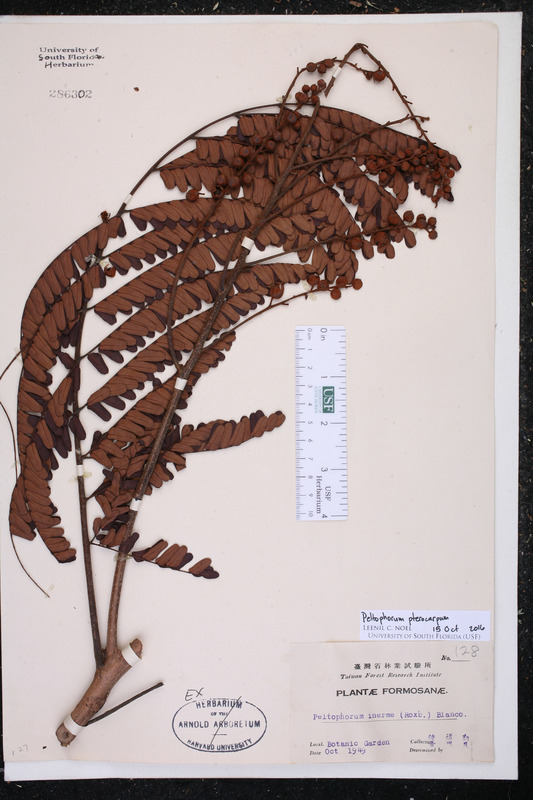 205669, M-13203; introduced as P. dasyrachis (Miq.) Kunz from Chandra Nursery, Phenok, Sikkim (India). USA Florida Miami-Dade Co. 23 Sep 1969 W. T. Gillis 8527 CULTIVATED. No accession records. Taiwan Pingtung Co. 02 Sep 1976 C. E. Chang 9283 CULTIVATED. Taiwan Zhongzheng Dist. Oct 1949 See comments s.n. CULTIVATED. Collector in characters to be translated. China 16 Nov 1956 Y. S. Lau 36 CULTIVATED. Curaçao May 1970 Fr. M. Arnoldo 3908 CULTIVATED.